The start of Spring brings one of the first well known wild flowers to our communities, the Snowdrop (Plúirín sneachta). The arrival of the snowdrop is considered a sign that the worst of Winter is over. Although the snowdrop escaped from our gardens and is not a native wild flower it is naturalised in our landscape. 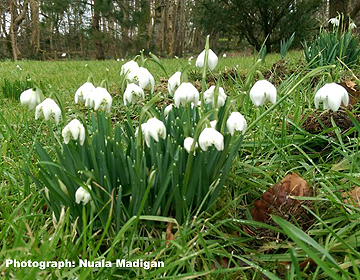 The snowdrop is said to be a naturalised species rather than considered an invasive species as it does not pose a threat to native plants in Ireland. In early Spring you will find this low growing flower under tree canopies, in our gardens and along stream and river banks. Growing from a bulb each bulb will produce three linear leaves and a leafless flowering stalk. The familiar flowers appear to have three large outer white petals but these are actually the flowers sepals. The main purpose of sepals on a flower is to protect the flower when in bud and to support the petals once they are flowering. On many flowers the sepals are green. The snowdrop has small white petals found inside the sepals. Each petal has a green patch located on a notch in the petal. For those of you considering to plant snowdrops you can purchase them as bulbs in your local garden centre. Snowdrop bulbs are best planted in Autumn three to four inches below the ground. The bulbs should be planted in fertile soil that is neither waterlogged in the winter or dries out in the summer. It is also essential not to delay planting of your bulbs once purchased as they can quickly dry out which can lead to the bulb dying. The best time to purchase the snowdrop from your local garden centre is in Spring. At this time of year the bulbs will be producing their green leaves and this ensures the bulbs are viable and as they are planted they will be already protected by soil. This entry was posted in Wildlife Watch at the Bog of Allen Nature Centre and tagged Attraction, Bog of Allen Nature Centre, Conservation, Family Nature Activities, Nature Trail, Places to Go, School Visits, Things to Do, visitor, Visitors. Bookmark the permalink.